Spider-Man’s symbiotic costume from the early 80’s is one of, if not the most iconic redesign in comic history. This is due to the incredible design and the fact that its alien origin led to one of the greatest villains ever conceived. Even with the over saturation of Venom comics the popularity has not waned. Today I am not going to dive into the origin of the costume. That has been done ad nauseum but with Spider-Man set to don the costume once more I though it important to highlight a set Venom fans might be interested in . Be warned though, it’s gonna be a challenge! The design variant is a popular one from Marvel. 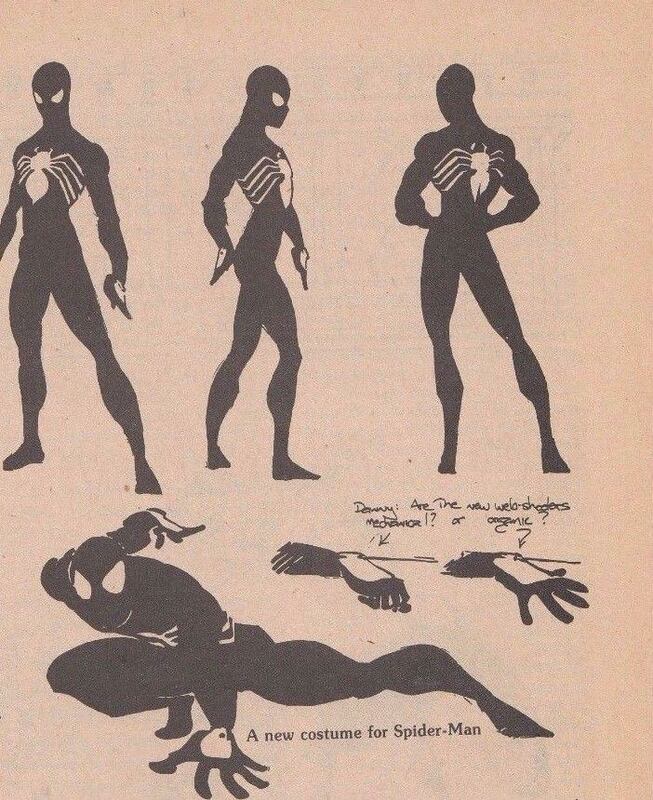 Well the black costume was given the same kind of treatment back in 1983 but over multiple publications, some of which have proven to be quite hard to come by. Here are all the known books that published Marvel’s design. Unknown until now this magazine published the right side profile on it’s own. It is the first known published image of the costume. I realized after looking at the other books that the costume profile must have been published somewhere as all the other angles were published on their own and later collected into one image as the release of ASM 252 approached. Probably the most well know of the bunch this book does well at auction. Shaun Leggit mentioned it on a recent Unpressable Defects Podcast and now finding cheap copies is a struggle. This book assembles all the views previously published into one image minus the shooters and crouch which we see here for the first time. For a time I thought this was the first time the costume design was made public. I believe the discovery of this book led to further investigation by passionate fans. This one published the crouching front shot on it’s own. And finally this book came out just prior to the first appearance. It is popular with collectors thanks to its misrepresentation as the first black costume. Unlike the others it shows a completely different version or prototype unseen anywhere else. After this the costume debuted in ASM 252 and the rest it history! Much of this info was scattered across the web minus a few key points. Collecting it and organizing it here was the goal. Good Luck! I’ve gotten both 252 and SW 8, but had assumed 252 was the first. SW8 is considered the more valuable why again? 252 is the more valuable comic and the first appearance! I don’t think SW 8 is considered to be more valuable, despite the iconic cover and the fact that it is the first in terms of continuity. Every fan should have that set including 252, Team-Up 141, SW 8 and Spectacular 90! Maybe it was the 1st in continuity vs published was the part I couldn’t remember. When I went looking for both, it seemed that SW8 was the more expensive book (at least on the cheaper end copies). I hadn’t done too deep of a investigative dive so I appreciate the perspective. Great detective work, Topher. I read somewhere that Amazing Heroes 38 has the earliest appearance of the costume. Not sure where or how to verify it. I think you mean Amazing 39 which is included here! Thank you for reading! Awesome job Topher. Thanks for the amazing work, I had no idea. Lol thanks Gary. Gotta be honest, talking live is fun but difficult. Those guys do a great job! I appreciate your message the other day too, in a way it helped me finally get to this article which has been brewing for a while. This one is meant to be more informative and not to suggest these books should in anyway supplant 252 but they might be important to the completest. Dang! Nice job with this! I love those Marvel Age books, there’s so many goodies scattered in there. Just like those DC Who’s Who we were talking about. Absolutely! Good luck with those too. They are still fun to read and a great way to learn a lot about DC history outside of just using the web. Great stuff Topher, I wish I had the passion and time to do work like this. I appreciate all you bring to this website and G+ group! WOW. I tip my hat to you Mr. Topher. Great piece of investigative writing. I love this type of article being that I consider my self a nephite in the comic world, I do learn alot from these write up. Thank you and keep up the great work. Great work once again Detective Topher. OOC, do you have any idea what the print run would have been on any of these books…? Sorry but I have no idea on print run. Other than the Marvel Age book you just don’t come across these often and when you do they are ususally not high grade.